Junior point guard Tyler Mola and St. John's (Shrewsbury) continue their steady climb up our rankings. 1. Cambridge (12-0; Last Ranking – 1): Only one game for the defending champions this week and they handled Westford Academy, 75-39, to remain undefeated on the year. 2. BC High (14-0; Last Ranking – 2): Carl Pierre and Travis Evee continue to lead the Eagles on an impressive run through a loaded schedule, and they’ll need to be at their best with four straight conference games coming up, beginning with a trip to Malden Catholic on Tuesday. 3. Everett (10-1; Last Ranking – 4): In the final GBL battle between two fierce rivals, Everett outlasted Somerville, 62-54, to earn its 10th win of the season. 4. Mansfield (12-2; Last Ranking – 8): Hornets scored a huge win over Bridgewater-Raynham on Sunday and have now rattled off five consecutive victories since losing at home to rival Franklin. 5. Needham (13-1; Last Ranking – 5): Rockets were challenged in league games against Norwood and Framingham, but managed to extend their thirteen-game winning streak. 6. Newton North (11-2; Last Ranking – 6): Superstar junior Ethan Wright (ankle) will be out of action for a few games. Still, the Tigers had enough to dominate Weymouth at home last Friday and will look to continue their winning ways at Brookline on Tuesday. 7. St. John’s Prep (10-3; Last Ranking – 9): When the Eagles lost by 22 points to a speedy Boston Cathedral team, questions arose about their ability to play in fast-paced games, yet a 67-64 win over New Mission dispels that notion. 8. Central Catholic (12-1; Last Ranking – 11): With a 55-42 win at Lowell, the Raiders moved to 9-0 within their division and are clearly the team to beat in the Merrimack Valley Conference. 9. New Mission (10-5; Last Ranking – 7): Titans rebounded from a close loss at St. John’s Prep by stomping Springfield Putnam at the MLK Invitational on Sunday afternoon. 10. Franklin (11-3; Last Ranking – 3): A road loss to Canton in another low-scoring Hockomock League affair sends the Panthers down to the bottom of our Top 10. 11. O’Bryant (11-3; Last Ranking – 23): The high-scoring Tigers secured a signature win by defeating Catholic Memorial, 81-62, at Northeastern on Sunday evening. 12. St. John’s (Shrewsbury) (11-2; Last Ranking – 14): Pioneers had little trouble with Westford Academy last Tuesday, but were pushed to the brink in a narrow 76-71 win over Worcester South on Friday. 13. Springfield Central (10-1; Last Ranking – 15): The Golden Eagles are still undefeated against in-state competition and reaffirmed their status as the top dog out west with another win over Springfield Putnam last Friday. 14. Brighton (9-4; Last Ranking – 10): Perhaps the Bengals used all their offense in a 120-point explosion against South Boston last Friday, as they were out-gunned by Ryan Reagan and Duxbury two days later. 15. Lynn Classical (12-2; Last Ranking – 18): The Rams continued to march to through their conference rivals with a hard-fought win at Beverly last Friday. 16. Catholic Memorial (8-4; Last Ranking – 12): A taxing schedule and lack of balance on the offensive end has the Knights reeling. Will their multi-season winning streak at home come to an end when St. John’s Prep visits this Tuesday? 17. Lowell (10-2; Last Ranking – 17): The Red Raiders couldn’t hang with Central Catholic down the stretch last Thursday, but have handled all other foes in recent weeks. They’ll get another crack at the Raiders this Friday. 18. Marlborough (10-3; Last Ranking – 13): Just when the Panthers appeared to be rolling again, they dropped a road tilt at Westboro to begin last week. 19. Nashoba (11-1; Last Ranking – 20): The Chieftans have won four in a row and will look to avenge their sole loss with a trip to Marlboro scheduled for next Friday. 20. 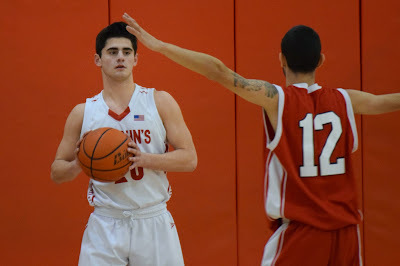 Bridgewater-Raynham (10-3; Last Ranking – 19): Trojans battled an excellent Mansfield team down the stretch and proved their worth as one of the better teams in D1 South. 21. Boston Cathedral (10-5; Last Ranking – 20): Calvin Cheek put up one of the most impressive lines of the season with a quadruple double (33 points, 10 rebounds, 10 assists and 11 steals) in a win over Cardinal Spellman before the Panthers dropped a game to Bishop Fenwick later that week. 22. St. Mary’s (Lynn) (10-4; Last Ranking – 24): Spartans have a very big week coming up with trips to Cardinal Spellman and Boston Cathedral on tap. 23. Marblehead (12-2; Last Ranking – 25): The Magicians kept rolling this past week with wins over Peabody and Salem. 24. Weston (10-2; Last Ranking – NA): As long as they’re not matching up with Cambridge, the Wildcats are capable of exerting their will on any opponents in the Dual County League. 25. Braintree (7-5; Last Ranking – NA): Behind one of the state’s most prolific guards in Nick Timberlake, the Wamps seem to be correcting their course after a very rough start to the season.